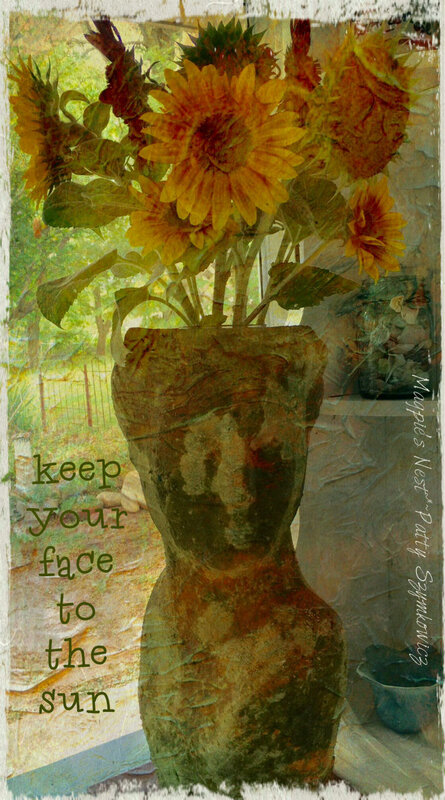 This entry was posted in Art Journal Journey Challenge Blog, iphoneography, Nature, Summer, T stands for Tuesday, Virginia and tagged Photography, Quotes. Bookmark the permalink. The best I like the sun flowers in the vase and the reflection of the mirror – superb!!! Sunflowers are just the happiest flowers! What a joy to have fields in which to pick your own. And what a great opportunity for photos! So sorry about that carpet, but it was a good thing you figured out it needed to go right away so that you weren’t breathing in those fumes for long. how can one not love the sunflowers? Did you see fields of them in France? Those are the only fields or farms I ever saw of them. Lucky you to live near so many wonderful places such as this along with the aquatic gardens too! I do hope your new carpeting will provide the warmth and non toxic environment you’re looking for. 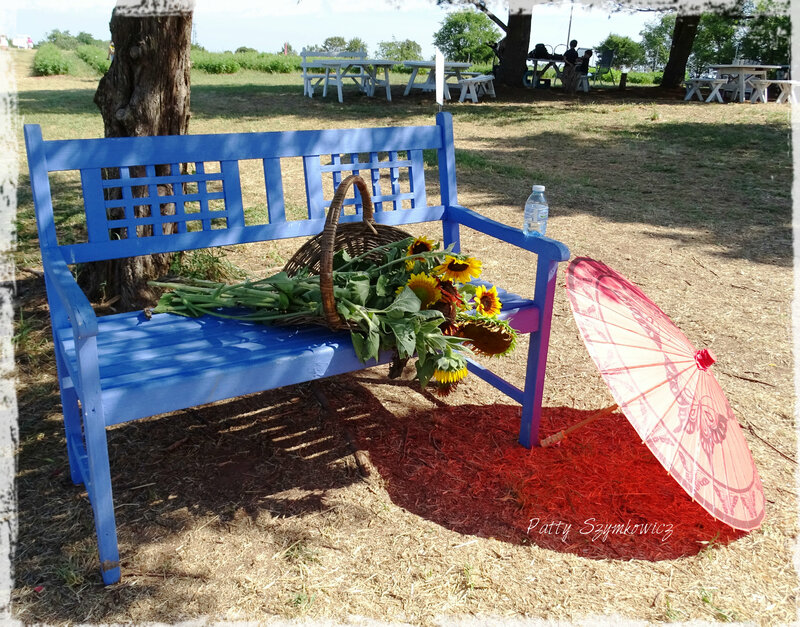 LOVELY photos and digital art Patty. That stone (?) vase is beautiful! Happy T day! 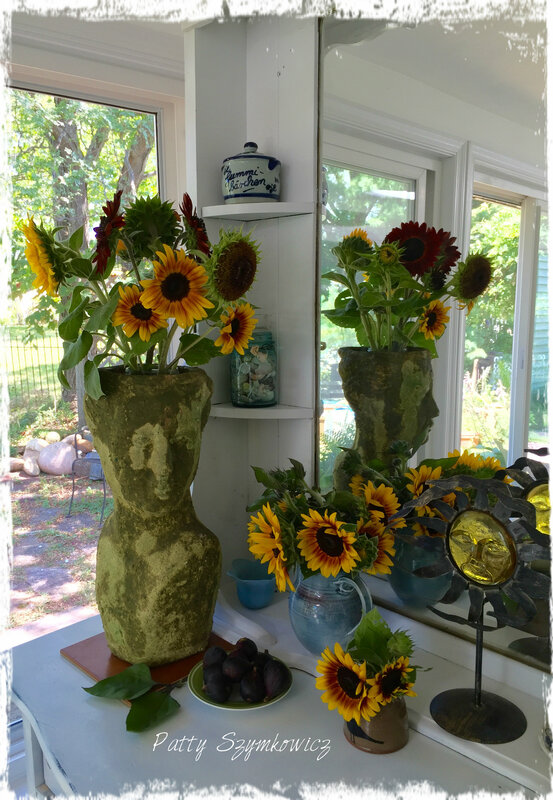 Those fields of flowers are magnificent and I love the way you displayed the sunflowers in those sculptural vases. Beautiful indeed. Sunflowers are such a cheer, aren’t they? Looks like a ton of fun! Oh – wow– an AMAZING post Patty! ADORABLE! And thank you so much for making that wonderful digital collage for Art Journal Journey! Wishing you a happyl T-Day and a good rest of the week! 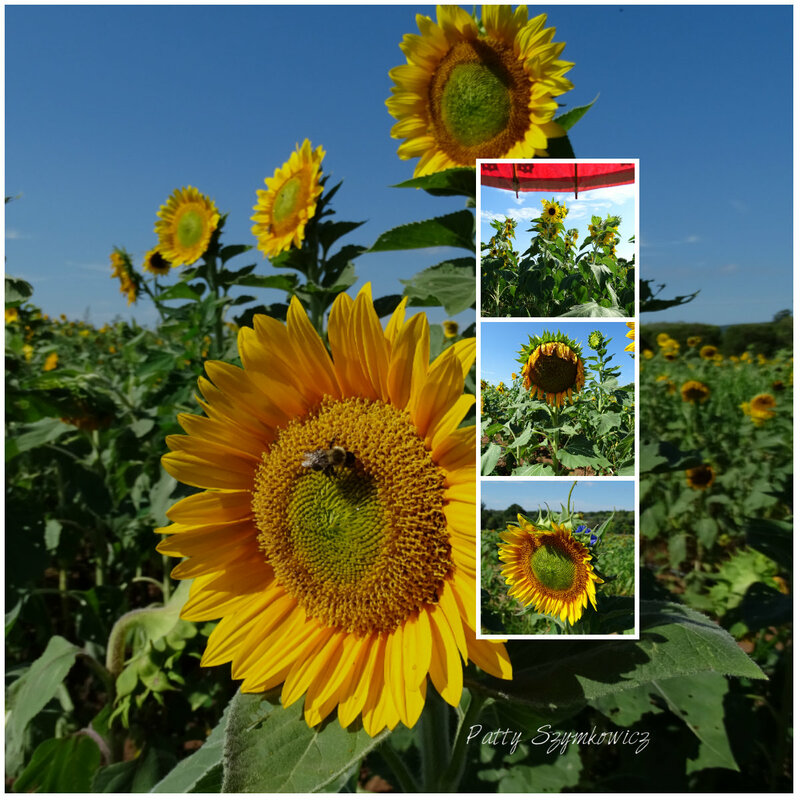 what a wonderful sunflower post. they really are cheerful! 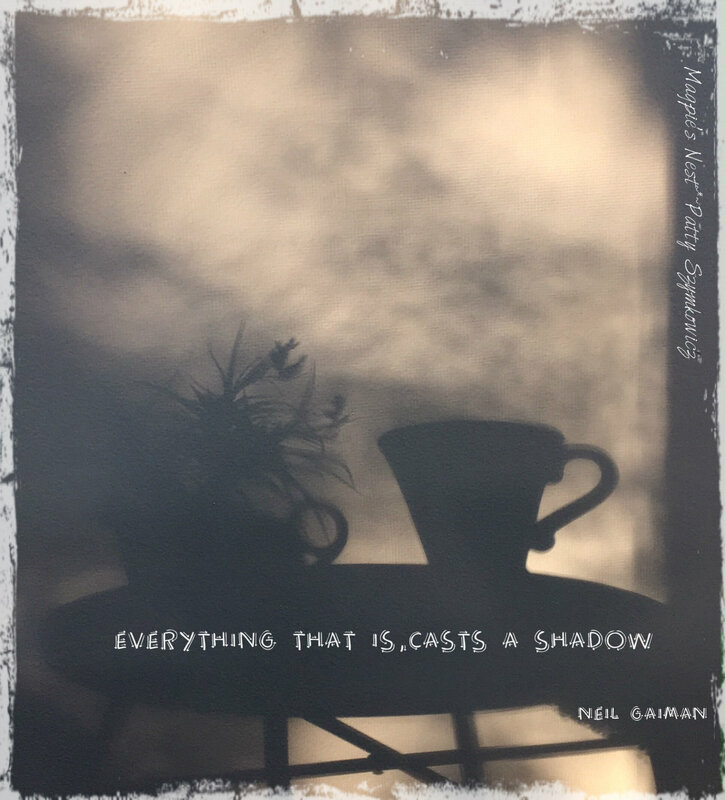 i also love the shadow photo. good luck with your new carpet and happy t-day! I was very impressed with the photos you took and the way you shared them. the little insets were a really nice touch. 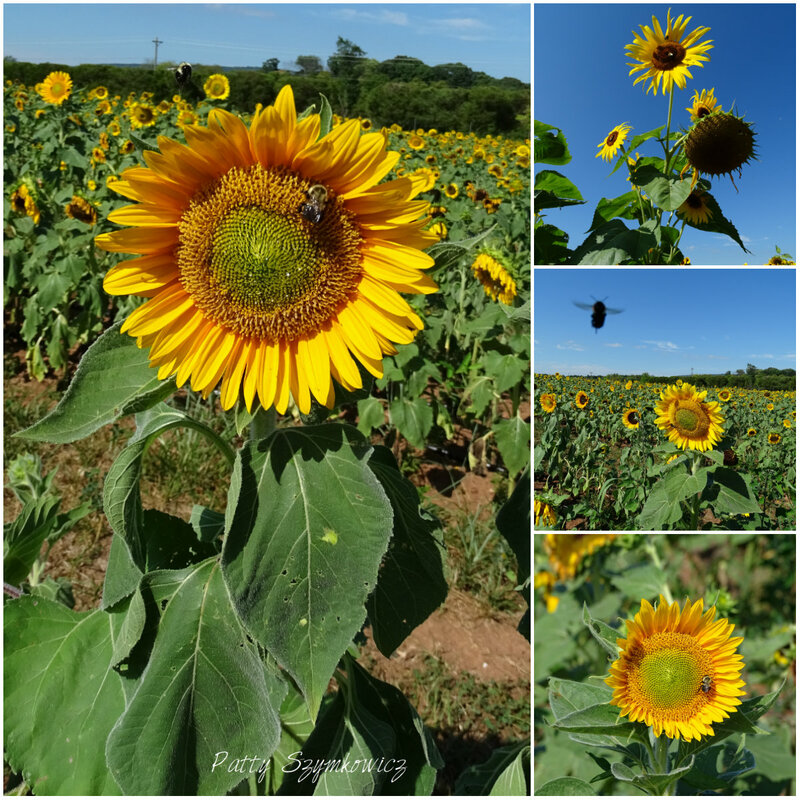 Looks like the bees have taken to this field of sunflowers. Seems the care the proprietors have taken have encouraged this, too. Your lovely vases of flowers are perfect and just what you need for bringing a bit of color and warmth to an already warm and loving home. While I was at WSU, one of the buildings was remodeled, and people started getting sick. They called it the “sick building” until the uni contracted a company to determine why students and faculty alike were getting sick. It turned out to be the —– you guessed it. This was back in the 90s before it was understood how dangerous some of the foam pads under carpets actually were. It’s good that you ripped yours out. Thanks for the info on the metal ruler. One thing I have often done, even though I don’t have one of those miracle rulers, is wet the edge of the paper I’m tearing with a slightly drenched Q-tip. No matter how thick the paper, the water does its magic and weakens the bond prior to tearing. Thanks for sharing your wonderful way for making those lovely edges. 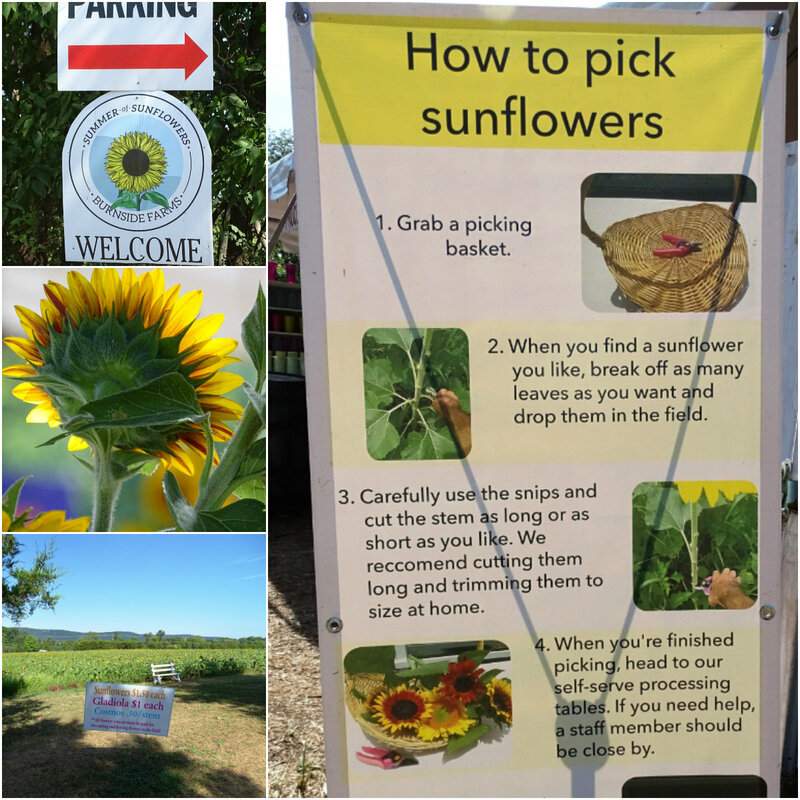 Really enjoyed reading about these beautiful sunflowers and seeing the lovely photos you took as a result of the visit. And thanks for sharing them with us for T this Tuesday. As I said – you have such style – I love your style! Now tell me Patty – how in the world did you accomplish this art journal page!?! 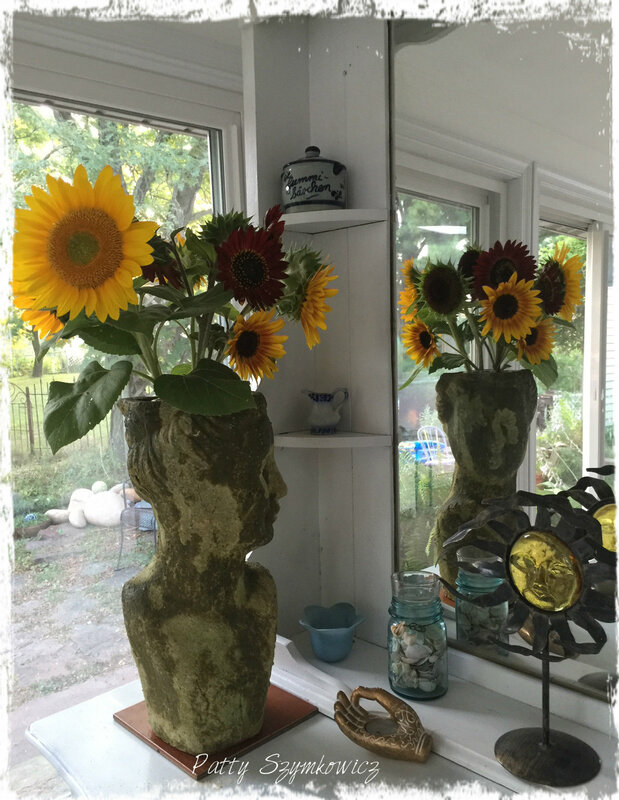 Sunflowers are my very favorite – I am working an a little spread but am really stymied as what do do! I have never worked with napkins before and I love it – the one I have used as such gorgeous colors and I don’t want to put anything on it!!! Oh woe is me. I forgot to tell you how very much I love the pictures! Oh Patty what a wonderful post, I just loved every bit of it. 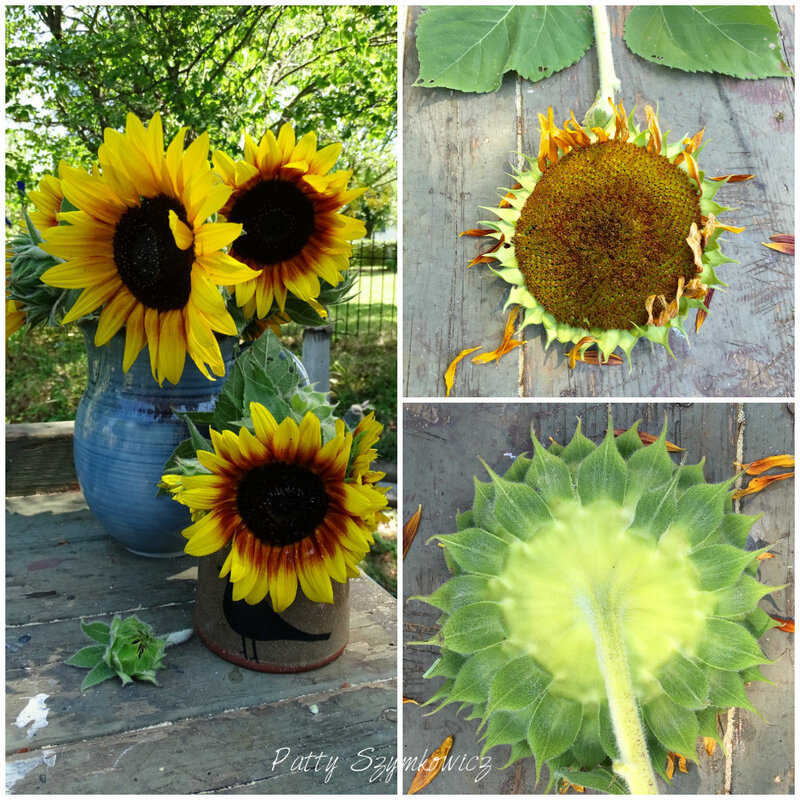 What a lovely and joyful post Patty – Sunflowers always make me smile.. and I had no idea there were so many variety’s. 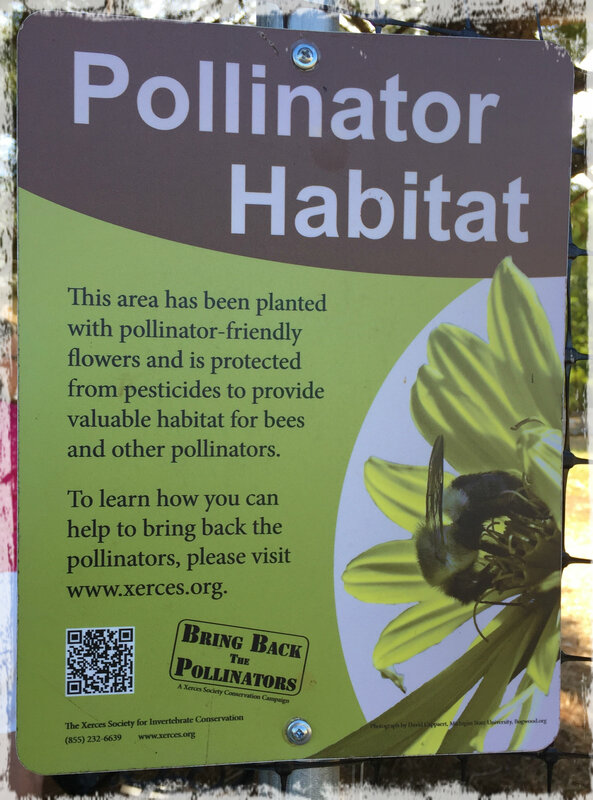 What a wonderful place, it was great to see all the bees on the flowers and did I see a morning glory sneak in one of the photos too? 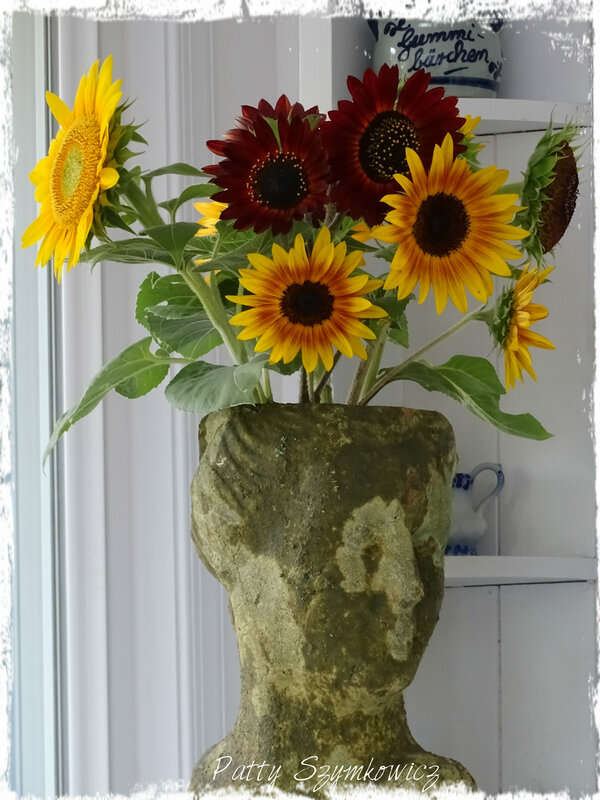 The Sunflowers look gorgeous in your home. Thank you so much for creating another gorgeous page for AJJ – the texture on it is superb .. I love it! Sunflowers just make me want to smile. 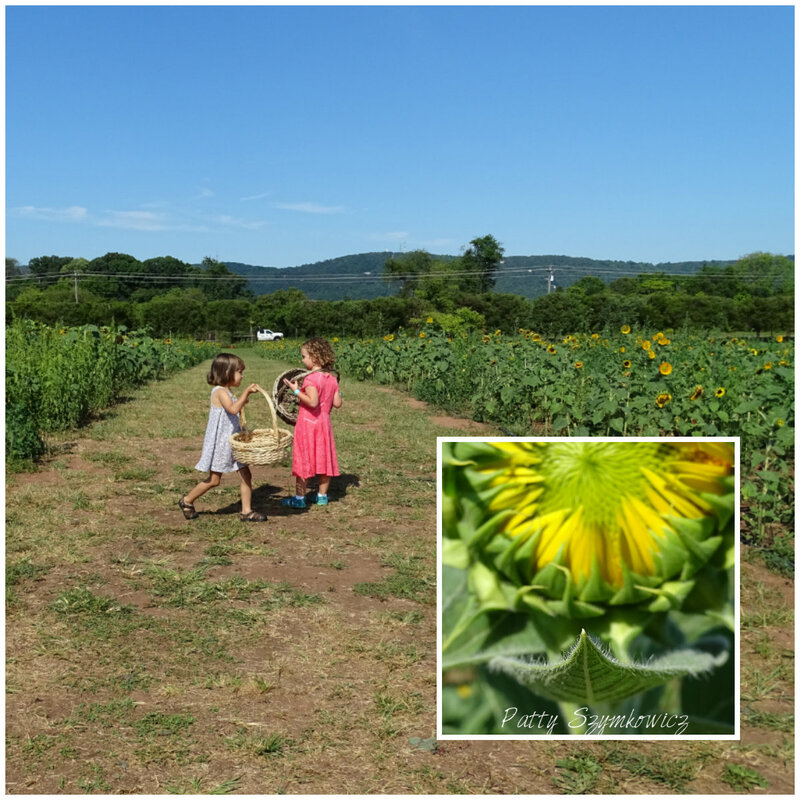 The fields of blooms look beautiful and so many varieties. I think picking them to take home and have displayed in the vases, is wonderful. Yours look great and its good that they will last a while . The journal page is lovely as well, with the words you added. Aren’t sunflowers wonderful? The are so cheerful. 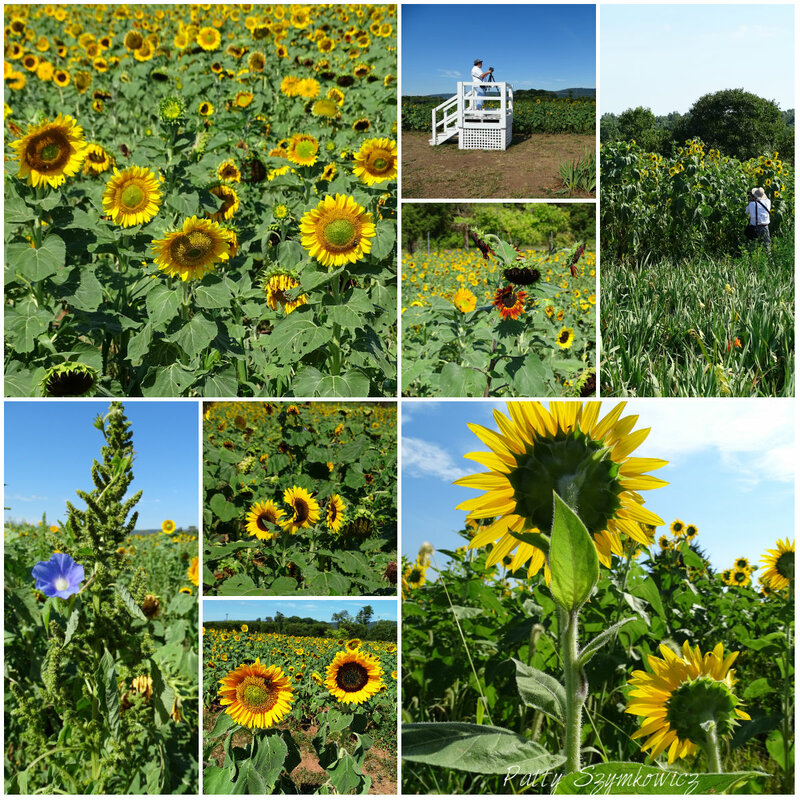 I really enjoyed your photo’s and I’m happy you were able to find a break in the weather to get to the farm. As for the carpet padding – you would think they might warn you. Hopefully the new padding won’t smell bad and the carpet goes in quickly. What a happy looking place! I love when I see wild sunflowers growing along the highway. I always imagine it’s from folks who are eating and sitting seeds out the window. Not too glamorous of start but nature finds a way. I love sunflowers!!! They are beautiful. Love that last picture…. great filter! Good call re the carpet pad!